The dashing Mr Hugo Devenish had come to London on an important mission: to prevent his innocent nephew from marrying an unsuitable young heiress. He'd never expected to be trounced upon by the most infamous thief in town! All society was agog at the rash of burglaries being committed by the mysterious Chinaman, but Hugo's attention was diverted once he was introduced to his nephew's heiress, the intriguing Miss Kit Singleton. Hugo found himself utterly enchanted. But her dubious background gave rise to the suspicion that Miss Singleton was somehow connected to the notorious thief. And Hugo could only hope to uncover Kit's many secrets, before the winsome beauty managed to steal his heart! This is a story that is just fabulous in my opinion fast paced with so many emotions that will pull at your heart strings as we journey to a HEA that will bring you to tears with the joy. Young Kit Singleton has arrived in London with a promise made to her father on his deathbed, Kit has never been to England she has lived a life no young English lady should through many countries and although she has learnt a lot about being a lady she has learnt a lot about other ways to survive in life but has Kit met her match when she arrives to live as the long lost Singleton niece with her Aunt Rose and starts her dangerous mission that meant honour to her father. 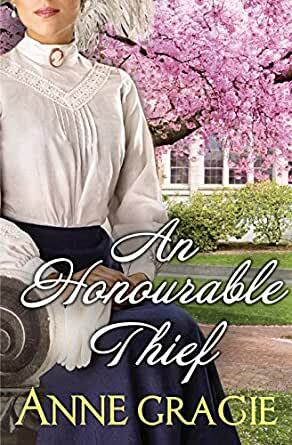 Hugo Devenish is a man of trade with family in the Ton and he has do what ever he can to stop his nephew from marrying an unsuitable heiress the young Kit Singleton who seems to be a mystery to The Ton, but Hugo is nothing if not determined to find out the truth about this woman. With burglaries going on things are getting a bit worrisome and there is a lot of talk and Hugo is on the job with his suspicions and he will uncover the truth. This is a beautifully written story I really liked Kit she is so strong and caring and honourable and she made me laugh and smile and of course Hugo is just the man for her the spark between them is really strong and gets stronger at every meeting. MS Gracie has never disappointed me with one of her stories and again this is one for the keeper shelf I highly recommend this one you will definitely be smiling and crying happily at the end of this one.